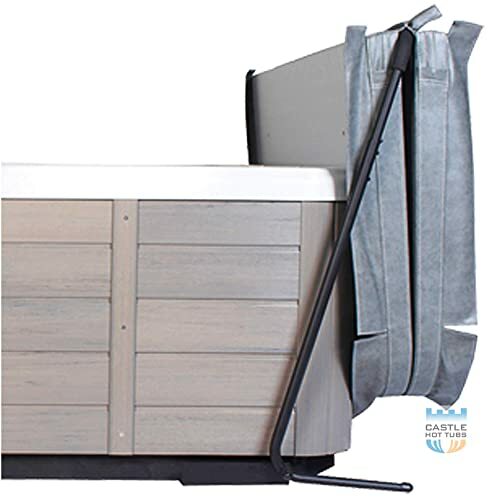 Battery Asking » Backyard » Best Hot Tub Cover Lifter (Reviews 2019)-Why should I invest on a cover lifter? Being a hot tub owner, you must well know the importance of having a good cover for your hot tub. Removing your hot tub cover or replacing it should be done with much care. But due to its heaviness, you risk damaging it when it slips from your hand and falls. Such a fall can affect its insulation foam, surface, or even the frame. Again, when you place it down, there can be a high risk of collecting dirt and later infecting your water. You therefore need a solution to cover and uncover your hot tub with ease. Try it out with a cover lifter, and you will find out that lifting your hot tub cover would be bliss. They are different cover lifters which work differently and which have different constructions. Some operate manually while others are automatic. Therefore, you might be wondering, which is the best hot tub cover lifter in the market? Some factors you have to be keen on while looking for a cover lifter are the price, shape, size, and the mounting type. You will also check space availability for the mounting of your cover lifter. But, you don’t have to worry with all that. We have done everything for you to give you the top seven best hot tub cover lifters for ease of selection. Follow the conversation to find out more about them. Q: Why should I invest on a cover lifter when I have a cover for my hot tub? Q: Must I empty my hot tub when installing an under the tub cover lifter? Q: I need a cover lifter that is easy to install. Which one should I choose? Q: Which is the most comfortable cover lift to operate? Did you identify your favorite cover lifter? Please leave your comments on the section here below. The manufacturers of The Cover Rock-It, Cover Valet, are a household name and you may know what that means. It means high-quality and well-built cover lift. It is an under-spa mounting made of heavy under-plate measuring 8.75 x 8.75” and two bars which are zinc plated and coated with powder to prevent rusting. Thus, it uses the weight of the hot tub when filled with water to safely secure it in place. It folds on the side of the hot tub neatly when lifted to uncover the hot tub which will give you the full use and view of the hot tub. It does not need a big clearance space. 18” is enough to fold it on the hot tub’s side. Cover Valet NP509 is another design from Cover Valet manufacturers. It is an under-cabinet mounting cover lifter that fits almost all standard hot tubs covers. It is constructed from high-grade aluminum which is also powder coated to protect it against elements and the water chemistry. It is easy to operate it that even an 8-year-old child can do it alone. It is gas-spring assisted which makes removing and replacing the hot tub cover using this lifter an effortless task. Cover Spa Caddy as it is often known is easy to install which will only take minutes to complete. Even though this is one of the best cover lifters in the market, one thing you might not like with this cover lifter is its installation method. You will have to empty your hot tub first for easy installation since the cover lifter has to go under the hot tub. But, the good side about this kind of installation is that it is firm and also, you don’t have to drill your hot tub cabinet or use any tool when installing your cover lifter. The clearance space of NP509 is 36,” and you can adjust its height. The unit gives you a 5-years warranty. Cover Valet 250 is made of stainless steel which has a powder coat finish for elegance look and durability. This is another cover lifter that you operate by dual gas springs for effortless lifting. One of the advantages with this lifter is that it has a locking facility which makes it safe to hold it open until you are ready to close it. What might be the downside of this lifter is that it is used on covers with 7.5’ only. But, it is versatile to fit any environment on your backyard where your hot tub may be. Whether it is in a gazebo, next to a wall or an awkward position, it will fit comfortably. Like Cover Valet Cuddy, this one has a locking feature for safety hold until when you are ready to close your cover. Cover Valet 250 has a backing of 5-year warranty. This shows that Cover Valet manufacturers are confident that their products are of high quality and the reason why it should be your best choice. The Smart Spa cover lifter is made to fit any rectangular or square cover of 96 inches and fits even better the ones designed with low profile. Using the pivot method of lift, it folds, then lifts up to store at the back of the hot tub giving you enough room to relax. You will install it by fixing on the cabinet which is easy if you follow the instructions carefully and it is manually operated. Since you will not be handling your cover directly, it will last longer with less wear and tear. Smart Spa cover lifter is made of aluminum with powder coating for quality and durability. It operates with a clearance of 18” at the back of the hot tub and 3” on the sides. However, the downside of this cover lifter is that it is not compatible with a cover for a sunken hot tub or an in-ground one. Apart from that, it is a great cover lifter that will solve your lifting operation nightmare. SpaceEase 200 is made of steel and aluminum which makes it sturdy and durable. It operates hydraulically using RPT (Reverse Pneumatic Technology) and dual pistons. It uses the pistons when you are lifting it and when storing or closing, it uses RPT. It is therefore easy to operate it to raise and lower the cover no matter the weight. When closing, the RPT system will apply pressure downwards gently to leave the cover sealed and therefore prevent loss of heat. When installing the cover lifter, there will be some technical issues to undertake such as cutting the steel lifter arm if your hot tub is below 80” which might be a challenge to you. Another drawback is that SpaceEase 200 will only fit rectangular and square hot tubs but not the round ones. Also, if your hot tub exceeds 90” or has the radius of its corner that exceeds 10” it will not fit unless you have mounting brackets to mount on the hot tub’s cabinet by screwing. Also, you need to be careful with the screws not to drive them through internal hose or vinyl. Otherwise, it is a cover lifter that you might have always wanted to have. This hydraulic cover lifter is another one from the leading manufacturers of cover lifters. Cover Valet cover lifter is meticulously designed for effortless lifting your hot tub cover and lowering it. It has dual gas hydraulic shock arms for its operation which use pneumatic pistons to make its operation bliss. It does not need much clearance space to store but 6” to 8” since it will rest upright. Therefore it will store in a less space environment on your backyard such as a gazebo or even against a wall. While some people may find its upright position a drawback since it might block their view, others may find it as an advantage to have their privacy. The cover lifter has a locking mechanism which holds it upright until you opt to close the hot tub. The Cover Valet lifter is constructed from sturdy steel frame which is powder coated and stainless steel that is zinc plated hardware. Also, it has two structures made of heavy duty metal which you will attach to your hot tub cabinet. Such construction prevents corrosion and harsh weather elements making it durable to last you an extended time. One thing you will like about this cover lifter is its installation. You don’t have to be an engineer to install the cover lifter. It comes with clear instructions and diagrams that are easy to follow to install. TCG, as it is usually called, is a cover lifter you might all along been looking to have. With this cover lifter, you can lift and remove your hot tub cover and also replacing it with ease since you will operate it hydraulically. No matter your age or your health issues, it is a lifter you can efficiently operate. This cover lifter is versatile to fit any hot tub cover as well as to use it either as top mount or a side one. It has gas shock which is non-corrosive that will enable you to lift the cover effortlessly. It is the best one-person hot tub cover lifter in the market. The lifter is constructed from aircraft aluminum tube which has a large diameter that cannot twist while in operation. TCG needs minimal area for clearance when storing behind the hot tub, so then you can have your hot tub near a wall if you choose. While following the installing instructions, you will find it easy to assemble the lifter with only a drill, wrench, and screwdriver. When you have a cover lifter, it will be a great assistance to you to lift your cover and replace it when closing your hot tub. Some hot tub covers in the market can be very heavy to raise them on your own and especially when already soaked with water. Therefore, investing on a cover lifter will make a significant difference in lifting and closing your cover. Yes, the best way in installing your cover lifter is under an empty hot tub. You will, therefore, lift your empty hot tub and slide the cover lifter under it. Using a small flat-head screwdriver, push it under your hot tub using a hammer while lifting it a bit. Leave your small screwdriver under the hot tub and next use another bigger and drive it under the same way you did with the small one. Once you manage to lift the hot tub off the ground for a little bit, you can use a crowbar to move it just a little bit higher so that the metal plate can slide under for only about 3” inside. Next, use a rubber mallet to tap the plate so that you can align it properly. Lastly, remove the screwdrivers and the pry bar leaving your cover lifter installed under the hot tub. This method is not as easy as it sounds, and it is not the best way to do it since it can cause damage to your hot tub. Therefore, you need to be extra cautious and if you feel it is not working the right way, stop and opt for the first method. The easiest to install is a detached cover lifter. 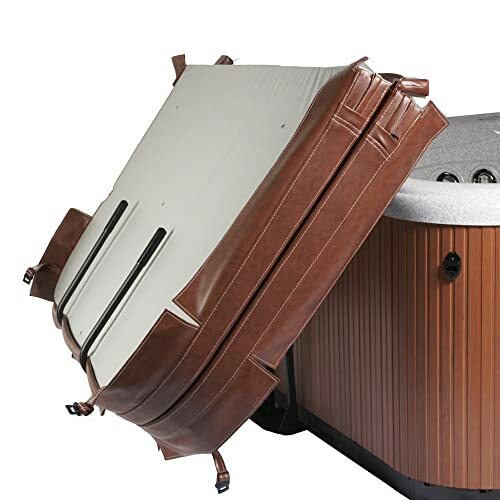 The detached cover lifter is the one that sits under the hot tub and uses the weight of the hot tub to balance the cover as it opens and closes. The easy to operate cover lifter and the most helpful is the type that operates using hydraulic pistons. The pistons are located in the cover lifter arms to balance the weight of the cover. Even though this is the most expensive type of cover lifters, it is convenient to use as even one person can operate it single-handedly. However, this type of cover lifter has a downside. Most of the hydraulic operated cover lifters will store while holding upright and therefore block the view on that one side. By now you understand and accept the fact that it is essential to invest on a hot tub cover lifter. There are different types and different products in our review. It is imperative to choose the cover lifter that suits you, your hot tub, and also your pocket. Choose the cover lifter that will have enough clearance space at the location of your hot tub. Remember, this is an investment that you might not replace quickly. Therefore, be cautious about picking the best hot tub cover lifter without making any blunder. Enjoy your soaking with no more worries on how to lift and close your hot tub cover.